It’s only April, a few weeks into the baseball season, and already we’re hearing from local media horrific phrases like “catastrophic to our baseball team” and “fatal blow to the Indians.” Yan Gomes has an MCL injury that will take him off the field for 6 to 8 weeks. 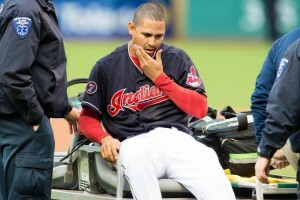 Carlos Carrasco has a contusion to the jaw area after he took a line drive to the face. Michael Brantley is struggling with back spasms.